Well, I was really looking forward to this Saturday afternoon. Nice weather, a break from some of the recent hectic travelings and a chance to get back out on the golf course to smack the ball around and get some good cursing going (ok....I'm not THAT bad on the course). But there was only one little problem. I went to the wrong golf course and as a result - missed my tee time. It was brutal. Especially when I started receiving texts from my golf buddies heckling me to no end. So I decided to do some office cleaning and card scanning. Not even close to making up for the "botch of the year". But I digress. 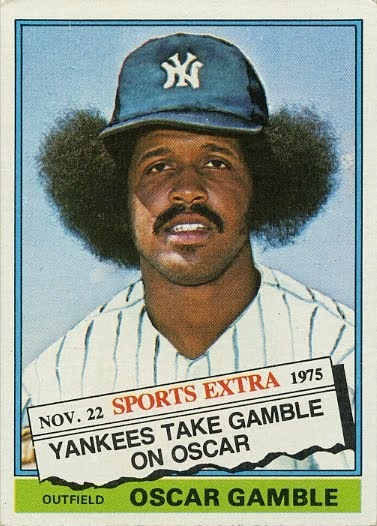 On to a nice story about cards. Right before I left for my trip to Brazil, I managed to make it out for the local trade night. I knew it would be an abbreviated go as I still needed to pack....and but stuff....and just do a bunch of overall prep work. I like to leave things to the last minute it seems. Anyways, while I was at the card shop I was really....REALLY wanting to open some packs. Sadly, there was no hockey product that was speaking to me. Even the baseball (which is my second choice) didn't have anything I was excited in. Not even the non-sports stuff was catching my eye. 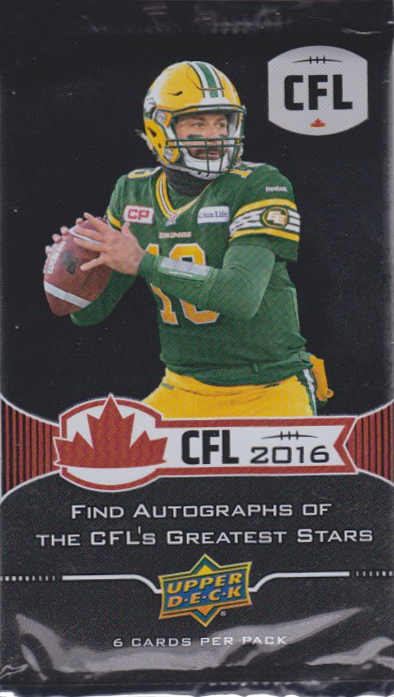 Worried that I would be leaving with no cards in tow, I decided to take a flyer on the recent CFL product just released by Upper Deck. The price was right so I decided to give a box a go. Shall we see how I did? I feel as though the CFL product has a pretty strong niche collector following - especially in Canada and I thought if I could hit a couple cards, maybe some trading could be had at future trade nights. The base cards are nothing jaw dropping. Simple design, some decent photos (some not so much) and a good overall checklist it looks like (163 base cards with the shorter print ones after card 100). 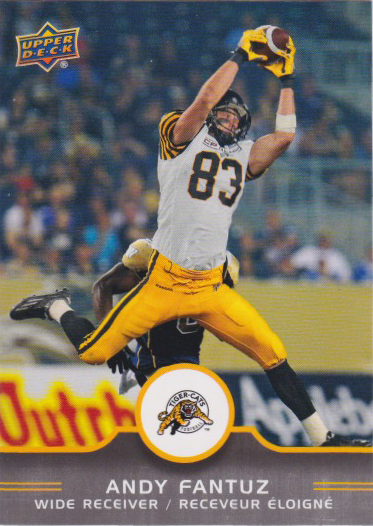 No career stats on the back...just the past 5 years (a bit of a miss here) but a good effort once again by Upper Deck. 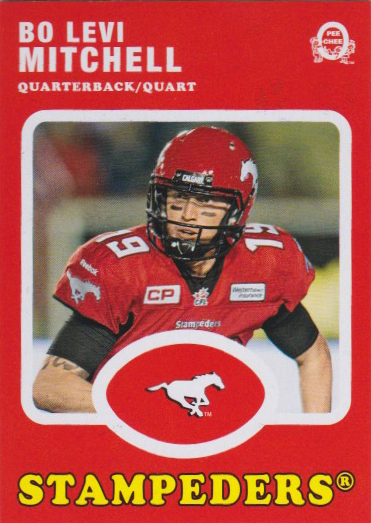 After all, this is their third year doing the CFL release. A breakdown of the base shows (and I'm going to go out on a limb with a guess here) that cards 1-100 are a given (I had about 15 doubles on top of that). So that's a real nice start. 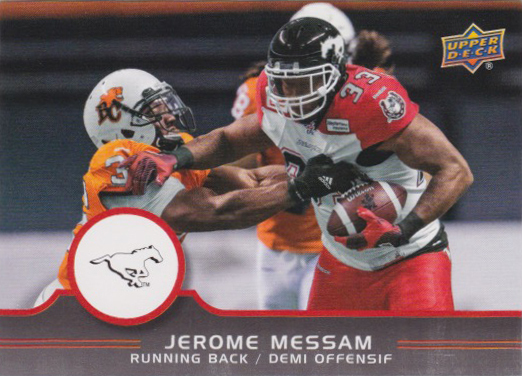 Cards 101-140 which are the special teams cards land about 1:2 packs. I ended up with 11 cards - no doubles. So some work to do if I want the complete base set. Cards 141-163 are All-Star cards and land 1:6 packs. I ended up with 5 so I exceeded the expected 4 cards I should have received. Nice. BTW....the horizontal cards don't do it for me at all. I think it exposes just how bad the logo looks on the front. I feel as though UD could have done a better job incorporating the logo into the overall layout of the card. Overall though, the base card offering in this product is pretty good. 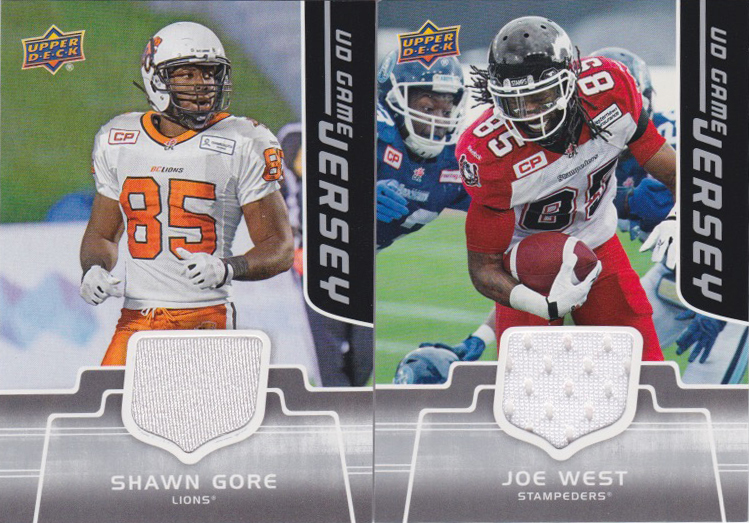 Some OPC retro cards in this product (42 cards) and they have their distinct retro look. I like these cards a lot - except for the smudging just above the photo. These have a definite 1971 feel to them and I'm sure that set collectors will enjoy the additional chase. They are 1:3 packs so I should have received 8 in total. The box odds call for 2 memorabilia cards and that's just what I got. Nothing to write home about but I feel like these would make for some good traders. More so than the dollar jersey cards you tend to get in hockey products these days. 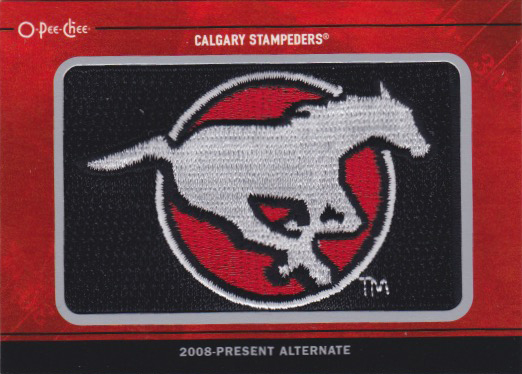 There are patch variations /15 in this product and a quick look on eBay shows some impressive patches. 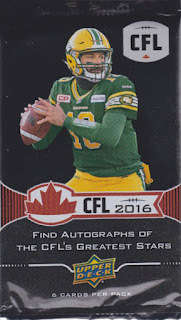 The more I look at this product, the more I see Upper Deck taking the best of the best from other signature sets and building a real nice niche product for diehard collectors. I'm impressed so far. Hey.....I got a thickie. This was a great surprise. These manufactured patches are another notch from the OPC belt. They come 1:128 packs so I definitely hit a tough one. 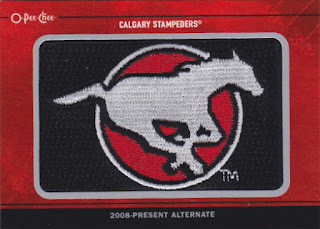 I especially like that I got a Stampeders logo as I know I'll be able to trade this one locally pretty easily. And a quick look at the checklist seems to reveal that these are an extension of previous UD CFL releases (as they are listed TL-51 to TL-62). Pretty cool. Wow! Another great box hit. 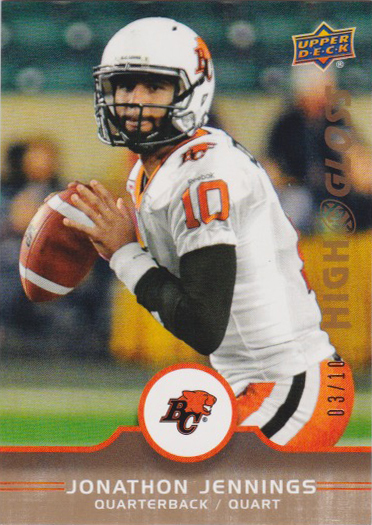 This High Gloss parallel is numbered to just 10. While not the top QB in the league, it's still a QB....and should get good trade value as well. I must say that I'm quite pleased with what this spur-of-the-moment pack ripping adventure has resulted in. But if only that was all. There are autos in this product. Three different types. Offence base card autos (40 cards) run 1:96 packs, Defense/Special Teams base card autos (12 cards) run 1:256 packs and then there are the All-Star autos (11 cards) numbered to /25. 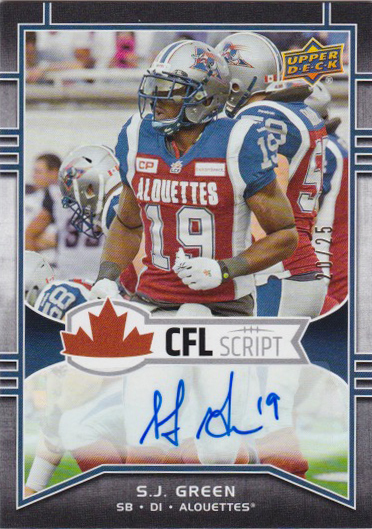 There are also CFL Scripts (which is what I landed) and they are also numbered to just /25. Yes, it's a sticker auto but still....more good tradebait. So.....I can say pretty confidently that I hit a really good box. Does that change my perception on the product? Maybe. Will I try my hand at another one? Doubt it. I really like that I have some good traders and should be able to recoup most (if not all) of my box dollars on this one. Pretty rare when that happens. If you're a CFL fan....then I would think that this is a must-try product for you. Have you ever stepped outside the box and tried a product you normally don't rip? How'd it go? Did it meet your expectations? Well....I feel like I accomplished something tonight. Better than nothing I guess. But make no mistake, I'd much rather be losing golf balls in the pond today. Ugh. 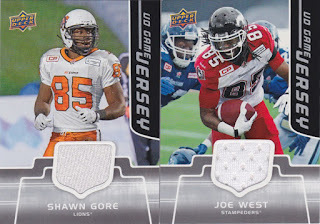 If you are interested in trading away some of these let me know. Hey there, I would definitely be interested in trading for your High gloss parallel - anything specific that you are looking for? I do have a person currently interested in the HG and possibly a couple others. Will keep you guys in mind if anything falls through.